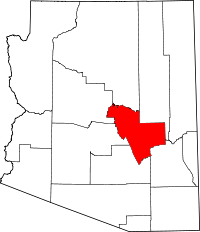 To obtain vital records of birth and death for Gila County you can apply to the Arizona Department of Health Services. You must be an immediate family member or a relative of the registrant engaged in genealogical research to obtain a certified copy. Marriage and divorce records can be obtained through the County Clerk of the Superior Court. The Arizona State Library and the Mesa Family History Centre are both good places to find non-certified copies of vital records.